Syrian War Report – July 18, 2017: Army Advancing On ISIS-held Town Of Sukhna 4.3636363636364 out of 5 based on 22 ratings. 22 user reviews. On Monday, the Kurdish People’s Protection Units (YPG) repelled an attack of pro-Turkish militants in the direction of Ayn Daqnah in the northern part of Aleppo province. According to pro-Kurdish sources, the attack was supported by Turkish artillery units. The artillery shelling also targeted YPG positions in Herbel, Sheikh Issa, and Tel Rifat. The YPG repelled the first wave of the attack and allegedly killed 20 pro-Turkish militants and captured a few vehicles. On Tuesday, sporadic clashes continued in the area. According to experts, pro-Turkish militants will not be able to break the YPG defense without direct assistance from the Turkish army. The Syrian Democratic Forces (SDF), backed up by the US-led coalition airpower, recaptured the whole Yarmouk district from ISIS and entered the Nezle Shihade district in the city of Raqqah. At the same time, US military sources denied reports that the SDF had allegedly halted its operations against ISIS because of tensions among Arab and Kurdish units of the group. The Syrian Army Tiger Forces and Tribal forces captured the Deilla oil field south of the government-held town of Resafa in the province of Raqqah, according to pro-government sources. The Tiger Forces and their allies are steadily clearing from ISIS key areas south of the Resafa-Ithriyah road. Numerous pro-government sources are speculating about the expected government push from the Resafa area towards the ISIS besieged city of Deir Ezzor. However, right now, this option looks unlikely. In turn, government forces are developing momentum in the direction of Sukhna northeast of Palmyra. According to local sources, the army and its allies have captured new points en route to the ISIS-held town. Reports about alleged government forces progressing towards the ISIS-held T2 pumping station near the border with Iraq are fake. Clashes are still ongoing in the area of Hamimah. that would mean a very long supply route to defend. isis is not yet weak enough. it is still hidding small units in the desert and mountains and can mount 20-30 men raiding parties that can overrun weak troops left to guard outposts. Behaviour has meaning; the lull by the TF will be explained soon enough. Tigers are not machines and like all other storm troops in history they need to rest and resupply, repair and service vehicles etc . Men who are exhausted tend to have a lower morale . The SAA is short of such trained units and those they have must not be squandered. Using Tribal Forces as bait would only encourage mass retreats as witnessed in earlier years. thid pocket is not important. now. but euphrates has strategic importance. this risk must be undertaken. if lose eufrates, syria is lost. therefore is important to attack on multiple fronts. alamsdarnews several times reported, 50 000 government troops are waiting for dez offensive. this is enough manpower to check out isis. The Euphrates will not be lost as Mosul is wrapping up PMU from Iraq border will merge with PMU Syrian units to form a cauldron via N7 & N4 and Iraqi border area. Also look for Iraqi Army to work north of Euphrates link up with SAA, Kurds beware and move aside or perish your dreams. The risk were too high to proceed. Even they ended taking up Euphrates and erecting new border in the name of Kurdistan autonomy taking much of the Syrian and Iraq territory they would end up having Turkey, Syria, Iraq, and Iran under united front glaring at them as potential enemy. This tiger forces and assad were a symbol of a winning resistance against imperialist and even now drawing a lot sympathizers from Afghanistan, Lebanon, Palestine, and Iraq. the saa should take szrian soil. pmu will not assist. the iraqi government forbad this. Not exactly. They said , for PMU to fight in Syria a vote in Iraqi Parliament would be required. Not much sense in this anyway , since branches of PMU are already fighting in Syria at least 2 years , without a vote of approval. The PMU is on the other hand recognized by the Iraqi government on equal standing with the Army. Without them , everybody understands , the Army would be in grave difficulties against ISIS.Let us not forget , the Americans at the beginning of the campaign on Mosul demanded that the PMU did not take part. The Americans are now insisting to the Iraqis , that the PMU does not mingle in Syria. But of course nobody pays attention , the Americans lost on all courts , their influence on the Iraqi government is waning. I agree go for the Euphrates and send Desert Hawks south to Sukhna or environs. Surely the place to deal ISIS big blows is in the open desert areas ? Create a large pocket there where close quarter fighting is not so prevalent. 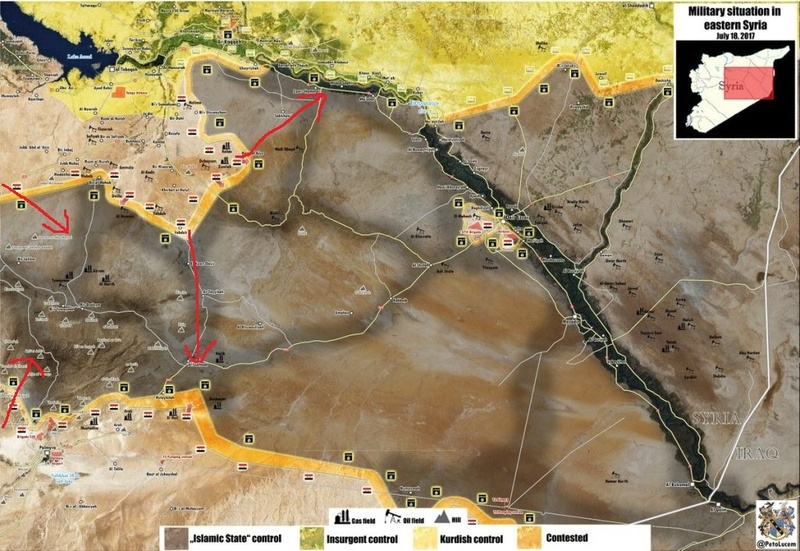 Once the vast expanses of desert are under control from marauding SAS style Long Range hit and run ISIS units the lines of communication will be safer and the pockets of resistance near Deir Ezzor city can be methodically cleansed of the US/NATO proxy terror gangs. The Iraqi forces will by that time have sealed the borders as well I hope and that will prevent the US creating de facto escape routes for their ISIS terrorists into Syria. i just hope SAA and russians are doing enough forward recon/observation to scout out daesh positions and maneuver and allocate their forces accordingly.